Black locust honey, thanks to its healing ingredients, is considered one of the healthiest foods and is highly regarded among beekeepers. How much is homemade black locust honey healthy and, how to dosage it and use it in nutrition, how to make tea from dried flowers and sweets find out bellow. Black locust honey is healthy and is one of the most valuable honey types. It nourishes the nervous system and removes the effects of accumulated stress, and helps us to treat insomnia because it provides a healthy sleep. This renowned bee product can remain in liquid state for up to two years, because it contains more fructose than glucose. It has a very slight taste and is easy to digest, so it is recommended in children's nutrition for over a year. Children love it most precisely because of the mild taste and the best recommendation is to give them a spoon in raw form, as well as with chamomile tea which is also has a very mild taste. In adults, honey in addition to alleviating the symptoms of insomnia, stress, and nervousness, it has proven to be very good for regulating digestion, especially in the presence of constipation. Black locust honey as a medicine is very effective in treating colds and strengthening the organism. It is best to keep it out of the reach of light at room temperature. White, pinkish or purple black locust or acacia, royal tree, as they call it, attracts attention with its beauty, lush crown and scent, but it is little known that acacia wood, which flourishes from April to June, has many healing properties. For medicinal purposes, a flower of chamomile, a red leaf, and a completely young crust are used, while the old bark is poisonous and should not be used. Except for the old bark, which has a toxic effect, it is also necessary to avoid matured leaves and raw seeds, as they can cause nausea, dilation of pupils, vomiting, bloody diarrhea, pulse weakening, and can cause shock to our entire organism. Severe cases of poisoning have not been recorded since these toxic substances are vomited out by vomiting. The aggressive reactions to the honey are possible because it contains pollen, but they are quite rare. 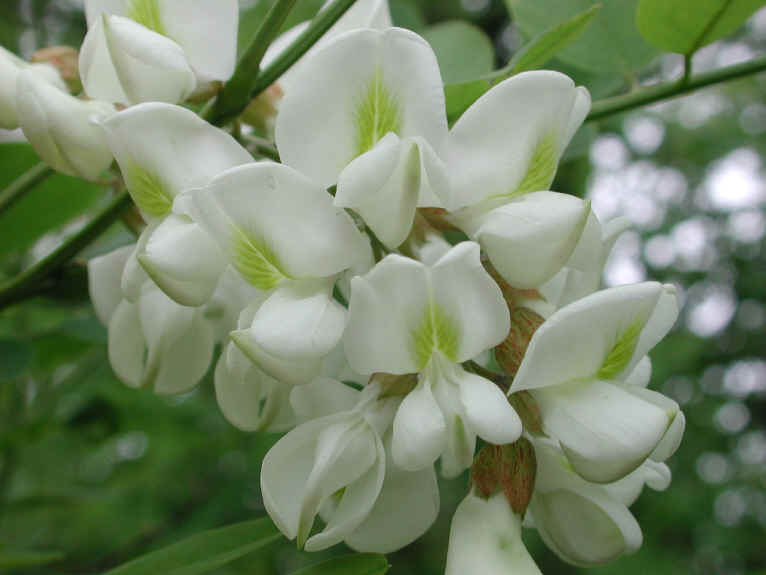 The flowers of the black locust contain vitamin C, essential oil, sugar, resin and tannin, while the seeds have about 38% of proteins, carbohydrates, vitamins A, BI, B2, B6 and C and magnesium, phosphorus, iron, zinc, potassium, calcium. The aromatic acacia flower secrets a lot of nectar, it is tasty in fresh form, but they are a real specialty when they are rolled in a dough for pancakes and frying. The black locust flower is plucked directly before opening, while the beans can be preserved by drying and used as vegetables. Baked seeds are a good substitute for beans, and fried can serve as a surrogate for coffee. The black locust juice is prepared in a same way as the juice from elder plant and it has an excellent taste. Since black locust honey can remain for up to 24 months in liquid form due to the high concentration of fructose, should not worry too much if crystallization has occurred before. Simply heating the jar in lukewarm and warm water will again return it to the liquid state. The best recommendation is to buy a homemade honey and if you still buy it in stores, look for one without a metal cover. The fact is that metal and honey do not go well together because it significantly affects the ph value of this bee product. Also not recommended is taking honey with a metal spoon for the above reason. The majority of natural products that are of a high quality, have no metal hinges on the shelves, shops and supermarkets, pay attention to this detail. The bark is removed exclusively from young branches, in May and September, and it is dried in the sun or in the warm air. The old crust is poisonous due to rubella toxalbumin and must not be used. The flowers are dried in the shade and stored in a well-sealed containers, as they quickly lose their flavor. In folk medicine black locust tea from dried flowers was used in the case of colds and coughs, to lower the temperature, alleviate rheumatic pain and toothache, and in doing so, is an excellent antiseptic. It also reduces the secretion of gastric acid and suppresses the heartburn, gastritis, but also the discomfort caused by stomach ulcer and duodenal ulcer. In homeopathy, black locust has a special place because it is used for the treatment of hyperacidity (increased acidity of the stomach). This beneficial drink helps in the case of migraines, as well as neuralgia, especially inflammation of the nerves of the face. Internal bark is used to clean the bowels and cause vomiting, while the root bark is used to treat nausea. If you hold a piece of young bark in your mouth you will alleviate toothache. Western folk medicine uses this plant for the treatment of cramps, viral diseases, skin diseases, for better urinary tract and digestive disorders. In addition, all phytotherapists recommend it to everyone and even small children to eat black locust honey. Adults can eat it alone or with a mild Chamomile tea, honeycomb or strawberries that even enhance its healing effect. If you are suffering from bronchial asthma, we recommend that you try this recipe with black locust honey, which you can use in addition to the therapy prescribed by your doctor. At the beginning, you need to boil the coffee and then grind it. Pour the fruit well and smash it until it becomes smooth. Mix together with a kilogram of acacia honey and finally add 20 grams of royal jelly. Take a mixer until you get a smooth homogeneous mass. Thus obtained natural remedy for asthma keep in jars and hold it in a dark place. Before consumption mix the mixture. Honey from the black locust consume with one wooden or plastic spoon before each main meal. This recipe can freely be used for bronchitis and other respiratory problems. This tea is prepared exclusively from acacia flowers. Sprinkle a full spoon with 250 ml of boiling water and leave it for three minutes. Drink two or three cups a day. Washed fresh flowers black locust are dipped in a mixture made of one egg, flour and mineral water. The mixture must be slightly denser than the one for pancakes. Black locust flower is plucked while it is still closed. To prepare sweets, it takes 60 grams of petals of flowers to be put in half a liter of hot water and cooked for 10 minutes. Then add 1 kg of sugar and cook until the mixture has thickened. In the end, pour a lemon juice or lemon cut into the rings. Cook until the teaspoon starts to separate two heavy drops. Remove from the stove, remove the foam and cover with a wet cloth. Leave overnight and pour the next day into clean and dry jars. Close with cellophane and slide to a dry and dark place. We hope that this article black locust honey was something you liked and that you will apply some of the recipes for your health. Please send us your request and we will gladly publish it on the blog as well as on our Facebook page. We also recommend the following texts: royal jelly for strengthening the immunity and how to make propolis drops.